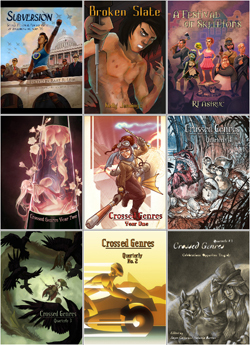 Only ONE WEEK LEFT to get all Crossed Genres titles for $20! January 31 will be the last day to get ebooks of all of Crossed Genres’ current titles for just $20 – that’s over 1,900 words of fiction per day (for less than $0.06 per day) for a year! • All for only $20! That’s 1/3 off the regular price! Go here for more details and to purchase the bundle!